In Novomatic’s Chili Heat slot game, you can meet your new best friend: Pedro! In this five-reel, forty-payline video slot, you can head on down to the Americas and feel the heat of Mexico. Arriba, Arriba! This video slot game is set in the mountains of Mexico. Blue skies, palm trees and a luxury villa are waiting for you when you load this game – not to mention lots of big wins and a red-hot jackpot! Mexico is a beautiful country home to Mariachi, piñata, the Day of the Dead and tequila! Mexico is also famous for its food! Burritos, fajitas, tacos, refried beans and lots of spice! Put on your sombrero and spice up your gaming with Novomatic’s Chili Heat. This is a great game for anyone who knows slots basics and wants a unique and fun game. Free Games with stacked Wilds can be won, too. The best thing about this Novomatic video slot is the massive jackpot! Thousands and thousands are up for grabs in this game. And it’s Pedro who’s going to help you win. Similar games from Novomatic include: Flamenco Roses, The Real King Aloha Hawaii and Flame Dancer. When it comes to slot symbols in this game, think Mexican and think spice! Except for the least valuable symbols that is, which are card values. All of the values over 10 are in this game and Ace is high! The instruments of the Mariachi band have higher payouts than these card values. Make some noise for the hand-painted maracas and the golden trumpet! These instruments are the card symbols need three well-placed matches to begin giving payouts. The beautiful senorita is the highest-paying ‘normal’ symbol. She’s wearing a flamenco dress and has a rose in her hair. She pays from two matches, along with Pedro! Pedro is the cheeky chap wearing the sombrero! He’s got a great moustache and he’s definitely on your side. You pal, Pedro, is the Wild symbol. He’s able to stand in for any of these other symbols to help complete a win and give you a payout. He also pays o his own from two matches. All of these symbols need to line up from the left to give payouts. Payouts will only be given if the required number of symbols fall on successive reels from the far-left towards the far-right, and on positions that represent one of the active paylines. Overall, there are 50 paylines but you can choose to have any number of them activated at any one time. Bets can also be adjusted, so anyone with any budget can enjoy this hot slot! The Scatter symbol in this video slot is a red, hot chili pepper! Mexico, home to the Habanero, is no stranger to spice. Neither will you be after you play this game. The spicy Scatter symbol needs three matches to start giving payouts. The matching chili peppers don’t have to land in sequence, they pay in scattered positions! 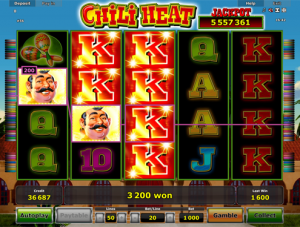 Also, with three or more chilis on the reels, you’ll get 15 Free Games along with your payout. Before the Free Games big, Pedro will go through a transformation and he will become a stacked Wild! You’ll see so many Pedros on the reels in the Free Games, you won’t know what to do with yourself. He has just the same powers as he did before – he’s able to give his own payouts as well as act as substitute when he needs to. What’s even better is that, now, he’ll be the symbol that can help you get the jackpot! In order to win the Chili Heat jackpot, you’ll need to see 25 Pedros smiling at you! Fill every position on every reel with Pedro and his moustache, and the jackpot will be all yours. The jackpot isn’t as big as some other progressive jackpots (it doesn’t give out millions) but it’s still a massive amount of money up for grabs. Life-changing for some! Vote for Pedro!